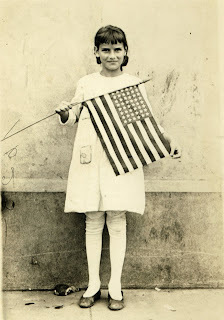 Vote Audrey: Happy Fourth of July! Well, America, as we celebrate our independence I'll be on I-20 heading back to Sweet Home South Carolina. I was 5 and it was one of those holidays for the pyromaniacs. Could have been the 4th, could have been New Year's Eve, I can't recall. My mother and father are shooting fireworks in the front yard as I stand on the stoop on the side of the house. As usual, I am wearing a dress, probably purchased by my Nannie. I may very well have pigtails. It's dark, but the light above my head shines bright, moths swarming around its florescent glow. Little tanks are sputtering on the concrete car pad and for a while I twirl sparklers, drawing circles in the air. High on my perch, a whole three steps of concrete up, I feel invincible. Now my father tries to light a stubborn little rocket, flicking the lighter and grasping the tube of damnation tightly as it rests atop the car pad. Now lit, the rocket takes off, but has no sense of navigation. It is going sideways, not up in the air! Now curving every which way, I realize doom is pending. I turn and run for the door, which appears locked. Pulling, struggling, but it's no use. I give up, turning around to see that devil spark heading straight for me. My parents are frozen in the moment, deer in the headlights of my oncoming death. The rocket turns, and goes right up my dress. What happened next, I'm not entirely certain. I remember the dress going up my dress and out the neck, shooting off into the woods, n'er to be seen again. Logically, I'd probably have my face blown off if that did occur but my head is still intact. Maybe the firecracker extinguished itself on my fine attire. It's been over two decades ago, and I try to forget, but you just don't forget a rocket soaring up your skirt. The lesson here kids is to carry a Roman shield to deflect such determined fiery darts sent from the Evil One. Or make sure you are born to parents who are a little quicker with their reaction time. Funny story.........ha......ha? EEEK! God was protecting you that day. Thanks for sharing this story, Audrey... found you through Twitter by the way. And I love Elton John too... Rocket man is COOL :-) Roger.